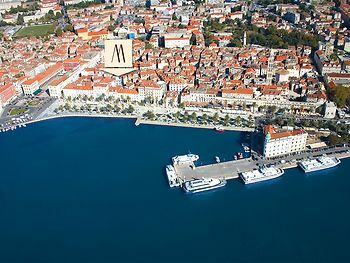 Hotel Marmont Heritage, Split, Croatia - Lowest Rate Guaranteed! Gorgeous little Boutique Hotel! Lovely friendly staff and gorgeous attention to detail in every part of the Hotel. The location was brilliant - right in the Old Town and breakfast was very pleasant. Thanks! A bit hard to find and parking was tricky with none on sight but we were able to get a spot about ten minutes away after unloading the car and it was a pretty walk along the waterfront. Modern small boutique hotel in the heart of Split beautifully located in the grounds of Diocletian's Palace. Rooms were extremely comfortable and well appointed although do not have tee and coffee making facilities. No street noise and extremely comfortable beds. Wireless internet access unlimited and at no extra cgarge. Excellent hotel with its own character, modern and with style, beautifully incorporated in its ancient surrounding in the very old city center.